This year's Giro d'Italia was his first Grand Tour as Sky's leader but, with Chris Froome competing in 2018, Thomas will miss the race. "This year my programme is based on what Froomey's doing," he said. Speaking to BBC Sport Wales, Thomas added: "I'm certainly going to listen to some teams. "Trek-Segafredo have shown an interest and there are some other teams as well. I certainly want to sit down and listen to what they've got to say. "I'm not getting any younger. I don't feel old, but I'm 31 now and I probably only have three or four more years at the very top, so I want to make the most of those. "I'm not saying I want to leave or I'm going to but I certainly want to sit down and see what everyone has got to say." Thomas is a prominent figure for Team Sky and, along with Froome and Ian Stannard, is one of only three survivors from the original squad of riders from Sky's debut season in 2010. The 31-year-old has also excelled in his supporting role as a 'super-domestique', helping Froome win four Tour de France titles. The Giro in May was Thomas' first chance to lead Sky at a Grand Tour, one of cycling's three most prestigious road races alongside the Tour and the Vuelta a Espana. 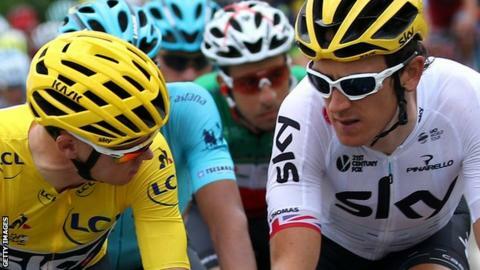 He recovered superbly by becoming the first Welshman to wear the leader's yellow jersey at the Tour de France, only for another injury - this time a broken collarbone - to end his race. Thomas wants another chance to lead in a Grand Tour - whether it is with Sky or another team - and he will speak to Sky's boss Sir Dave Brailsford to see if he can guarantee him those opportunities. "That's one thing I've got to sit down with Dave and talk about," Thomas added. "He's texted me a few times and we've got a training camp next week so we've certainly got time to have a chat. "It's a team sport but at the same time every individual in that team has their own goals and aspirations, what they want to do in their career. "I'd love to go to a couple more Grand Tours as a leader and fully target them and just see what I can do, whether that's ninth, winning one, third or fourth, whatever really. It would be something I would really like to go for before hanging up my bike, so to speak." When Froome leads Sky at next year's Giro, he will be aiming to become only the third man - after Eddy Merckx and Bernard Hinault - to hold all three Grand Tours at the same time. Thomas says he would have "loved" to have had another go at the prestigious race in Italy but the silver lining to his absence is that he will be fresher for the Tour and, potentially, the Vuelta in August and September. "Yeah, I think so, and in the Tour as well, especially if Froomey does the whole Giro," said Thomas. "Last year was unfinished business but with Froomey going there he's obviously going to be the main guy, so I don't want to go there and just... I've ridden a lot of Grand Tours in support roles now, so I'm just looking to get those bigger opportunities myself. "His whole preparation is totally different to normal and you just never know how he will be. He might be on his knees at the end and we [Team Sky] might need that second back-up guy to be there and be good. So that's a nice goal to have. "Obviously Froomey will still be the leader going into it but it might be more of a chance for me to have more of a go myself. "The Vuelta after that could be a potential race for me to go into in the full team leader role." "My management company, Rocket Sports, is part of Rocket Music, where Elton is the boss," said Thomas. "I was supposed to have met him on a few occasions and it hasn't happened, so Sara, my wife, and I finally got to meet him. "It was surreal because he's a bit of a legend. He was a super nice guy and it was a great night."